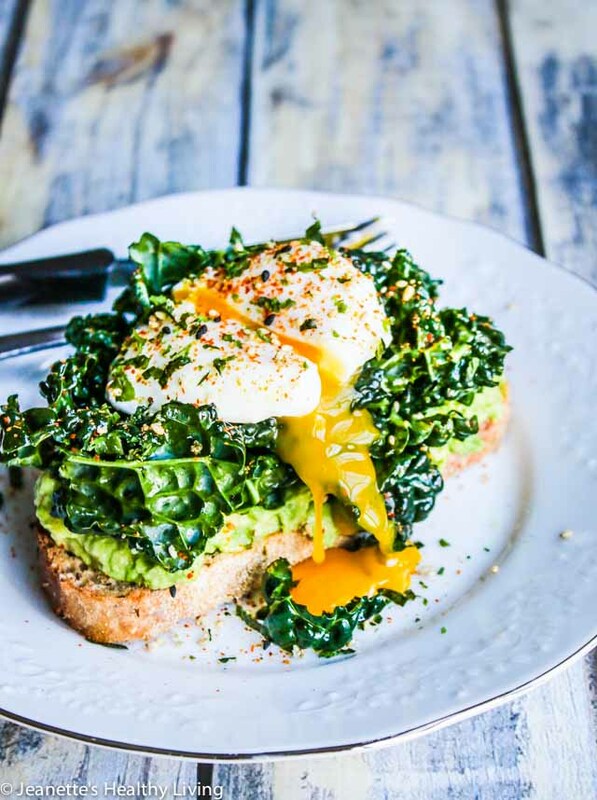 Smashed Avocado Kale Poached Egg Toast is a healthy and delicious breakfast, packed with nutrients to start the day. 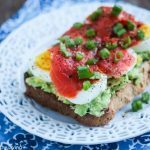 I love savory breakfast foods, and smashed avocado toast is one of my favorites. There are so many variations – it’s really up to your own imagination. A few years ago, I had a simple avocado kale toast at a local restaurant for breakfast. 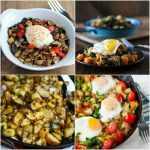 I loved the idea of incorporating kale at breakfast time. 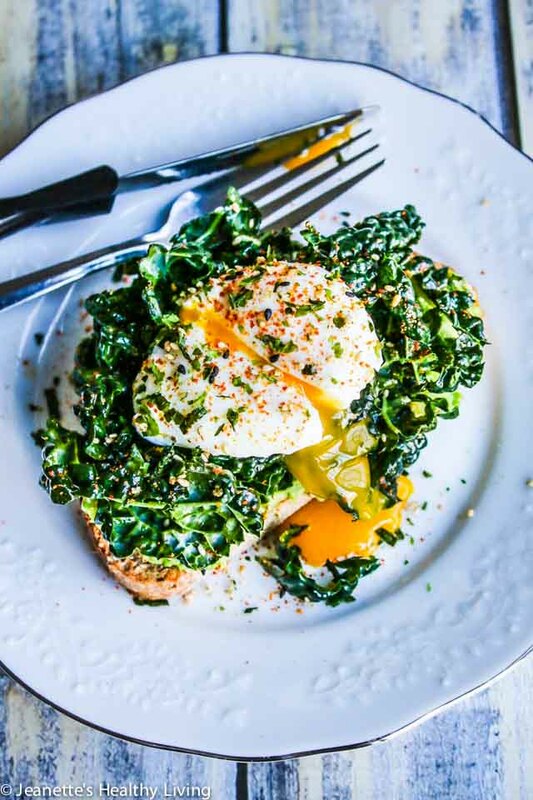 A runny poached egg on top is the pièce de résistance to this delightful breakfast or brunch dish. Avocado toast became popular a few years ago, and now it can be found on restaurant menus. 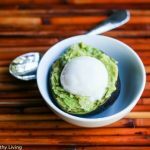 In fact, an”avocado bar” recently opened that serves all things avocado – avocado toast, avocado in salad and bowls, and avocado smoothies. I keep a few avocados ripening on my kitchen window sill almost all the time so I can make guacamole, smashed avocado toast, or toss it into salads. This smashed avocado kale poached egg toast was inspired by an avocado toast I had a few years ago at a local restaurant. Honestly avocado toast is so easy to make at home, there’s no reason to pay a premium eating it at a restaurant. The key is to massage the kale with a little olive oil, lemon juice and salt to soften it up a bit. This is a little bit messy, so alternatively, you can use utensils to toss the kale with olive oil, lemon juice and a pinch of salt and let it sit for a few minutes. I prefer the more tender lacinato kale leaves to the curly variety for avocado toast. The pièce de résistance is a runny poached egg. 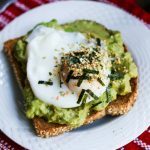 A sprinkle of furikake and togarishi (Japanese seven spice blend) finishes this gorgeous, deliciously healthy Smashed Avocado Kale Poached Egg Toast. 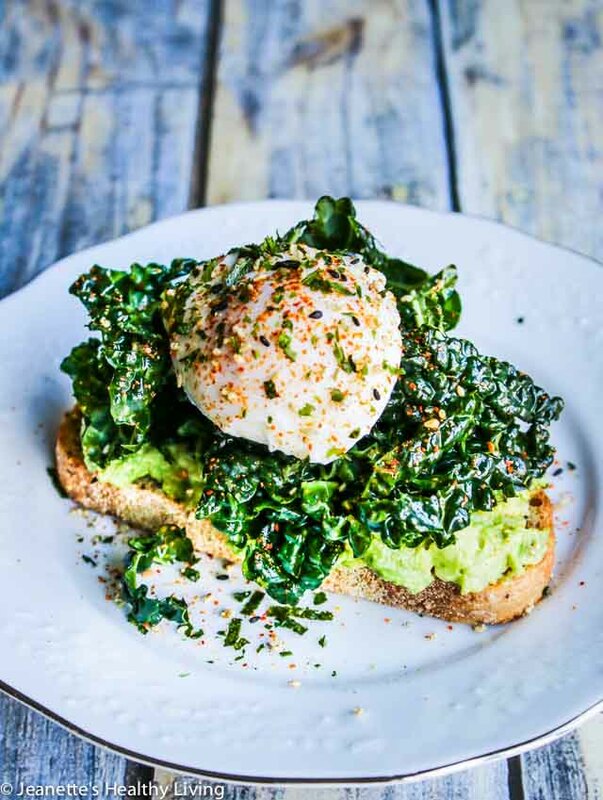 Enjoy this Smashed Avocado Kale Poached Egg Toast. 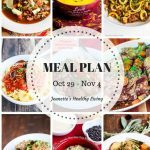 It’s loaded with protein, fiber, and nutrients, and has just 327 calories per serving. Put garlic in mortar along with a sprinkle of sea salt. Pound until pureed. Add avocado and smash; season to taste with sea salt. Toss sliced kale leaves with olive oil, lemon juice, a pinch of sea salt and a dash of black pepper. Toss well or massage with your hands. Let sit for a few minutes until leaves wilt slightly. Bring small pot of water to a boil; reduce heat to a simmer. Stir water in pot until water swirls around. Break eggs into pot, one by one. Poach eggs for 2 1/2 - 3 minutes, depending on your preference. Use slotted spoon to remove from water. 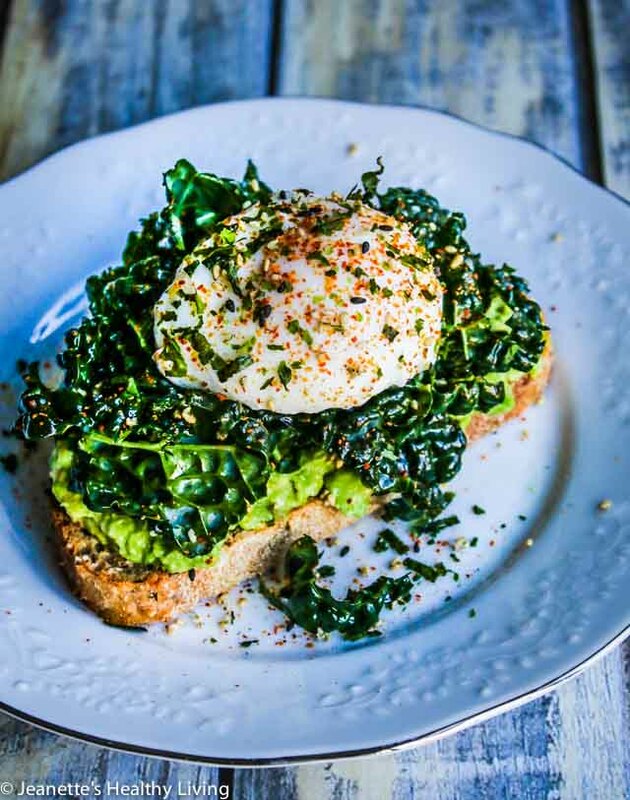 Top each slice of toast with smashed avocado, then top with kale, and finally a poached egg. Sprinkle with furikake and togarishi if desired. 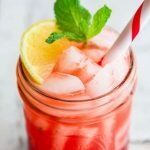 Cayenne pepper or smoked paprika could also be used. 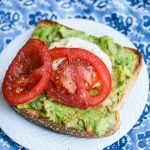 Thanks Angie – the runny egg makes this avocado toast extra delicious! I made this for brunch this morning and it was absolutely gorgeous. I spent a bit of time in Australia a while back and they LOVED smashed Avo; adding the kale on was something I have never thought of though. Such a great breakfast idea. 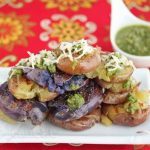 Hi Misti, so glad you enjoyed this version of avocado toast – thanks so much for letting me know! I made this for Sunday breakfast. Truly a savory meal. Loved all the flavors. Serve on a wheat roll. 😋 WOW! 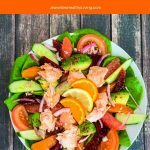 John – so glad you enjoyed this for breakfast today! 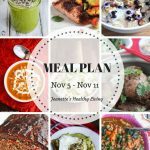 It’s a great savory breakfast/brunch.